Blog Blaster, Feed Blaster, Instant Booster, e-Trinity Internet Marketing, and Sebastain Foss (if that is even a real person) represent some of the lowest members of the internet marketing food chain. Right below pond scum in my opinion. Here’s why. It doesn’t happen every day, but I just got scammed by an internet marketer last week. I have been talking to more and more “old school” internet marketers lately, which means I am getting added to their mailing lists as well. I received an email message about a product called Blog Blaster that promised 2 million blog backlinks that come from opt-in blogs all over the net. Their sales letter promised that this would be a 100% spam-free. Opt-in advertising systems are awesome, so I though I had stumbled onto something that could give my blog an edge on the web. I eagerly sent my PayPal $49.99 and downloaded the Blog Blaster software. 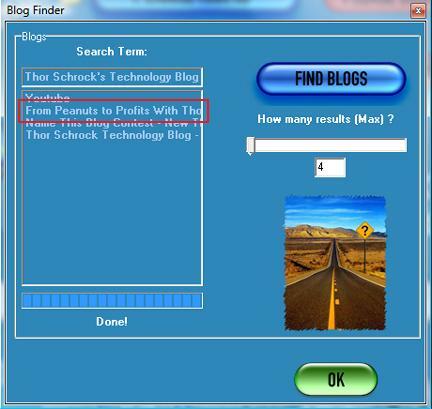 I did a search using their software for “Thor Schrock’s Technology Blog” which is an active Google search term. I FOUND my OWN BLOG in their list of opt-in blogs and of course, I never opted in. I decided to see exactly what happened when I blasted my own blog through Blog Blaster’s so called opt-in blog advertising service. NOTHING happened. Not even a spam comment. But it seems that other bloggers are very familiar with Blog Blaster and know how it works. I emailed a few of the other bloggers that showed up in the list of “found blogs” to see if they might have opted in. Two bloggers responded. Here is what they said. You sent a note about blog blast through the contact form on our site. Don’t know anything about so not sure I can help you. Blog blast is just a comment spam application – they blast lots of blogs with comment spam, in the hope that some of these will automatically publish the spam. Mostly it’s just filtered by anti-spam tools like Akismet. The minority that are published usually have nofollow on the links, which makes them useless for ranking on Google. It’s also been suggested by Akismet could be hosted on Google servers, and therefore domains promoted via blog blaster could be on a fast track to being banned from the search index. So, overall, blogblaster is probably not a worthwhile investment. Obviously, no one opted into this “advertising service”. Once I realized I was was scammed, I filed a PayPal charge back, and then starting looking into how I was taken in by such a scammer. I even fired off a “Blast” to my own blog to see what happened, and sure enough…. crickets… Not a thing – not even a askimet spam comment. Those of you who read my blog regularly know that I was able to use the knowledge I learned in Joel Comm’s Secret Classroom to really propel myself to a profitable online presence. One of the things I did to accomplish that was offer my personal contact information so that people who had been burnt by people like those at Blog Blast in the past would be willing to trust me. When I looked back at the emails I received, I noticed that the e-Trinity emails came in on the rebate address I set up for my Secret Classroom program and posted on my Secret Classroom sales letter. e-Trinity Internet Marketing scrapped my email address from my website and then sent me unsolicited email promoting their product! So here we have a company who calls themselves a legitimate internet marketing company who scrapes email addresses for their list off the web, lies on their sales letter, offers a product that is supposed to spam blogs, but actually doesn’t work at all – even as a spamming program. After I realized I had become one of the many internet marketing victims on the web, I immediately “unsubscribed” from their evil spammer list. Thus, your ad will reach a very broad range of potential customers with each use of Feed Blaster! Feed Blaster is the first & only submitter that can submit your ads to thousands of feeds within a few minutes! Post your ads where people read them! – What if you could place your ad into all these feeds ? What a SCAM! if you post to people’s blogs with a spamming service, your links will show up in their comment feeds. The trouble is that this is a dishonest way of advertising and even worse – since their blog blaster program doesn’t work, this won’t work either! I also received this email after unsubscribing! How would You like to divert 1000s of fresh, new visitors daily to Your web site or affiliate web site from Google, Yahoo, MSN and others At $0 cost to you…? …iNSTANT BOOSTER diverts 1000s of fresh, new visitors daily to Your web site or affiliate web site from Google, Yahoo, MSN and others at $0 cost to you! INTSANT BOOSTER will pull in hordes of potential customers to your website – instantly! I am done with these fools. I did a Google search before I purchased to see if this was a scam, and found nothing. Something tells me that is about to change. First of all – congrats on winning the JV Contest for Secret Classroom! I’m sure this will be one of many wins you’ll be getting over the years! Next – thank you for the straight talk you provide here on your site! It’s refreshing! Keep up the great work – and have a DYNAMITE day my friend! Kind of funny! Thanks for trying and letting the rest of us know! it’s unfortunate you fell for those shenanigans. I hate being scammed. The last time I was scammed it was by that fool Don LaPre back in the ’90s. Since then I have been very picky about purchasing any kind of marketing tool. I hope you get your money back and just remember nothing beats the old “get out there and do it yourself” routine. Sorry to hear you bought their product. I hope you get the money back. That’s pretty ridiculous. Searching through google was what I used to do before spending my money. I need to be more careful now. Hope you will get your cash back. P.S. I like your contest and posted about it. Yeah, I guess I just had my rose colored glasses on. Still no refnd from the scammers, but the good news is that my site is now the #5 hit for blog blast scam. I thought this was a scam too AFTER purchasing. The software appears to be doing something but really nothing happens. I received my full refund — but another lesson learned too! Thanks for your informative article Thor. Like others on this page, even I do search with the company name and “scam” or “ripoff” etc. and read before buying anything on the net. However, I do try to read between the lines because many times the competitors put up such pages. About Blog Blaster. Blog Blaster is Not New. It’s an old software. When it first came out I used it and got fairly good results. I’ve also used etrinity’s other products, such as instant boosting which through tracking my ads gives me pretty good results. I use it daily and have been for about a year now. I found this post in search of maybe finding a product that etrinity has launched in 2008. Hate to go against the grain, but his products ‘do’ work for me, otherwise I wouldn’t use them. Instant Booster is exactly what I thought, a useless application. That’s one of the reasons why I not longer recommend any of those “traffic booster” as a resource to increase website traffic at our site. Thanks for sharing your experience with us. – Javier. Sorry to hear about the burn job but I hear where you’re coming from. 2 years ago I bought Blog Blaster and used it for 2 weeks straight and never got a single link back, got an email from my ISP saying I was spamming and started to get a bunch of undeliverables from the same address. Needless to say I never could get in touch with Sabastian “the crook” Foss or his so called company for a refund, so I hope Paypal has a better chance at getting your cash back. Oh yah, even though I keep unsubscribing, I somehow keep getting email for the dreaded 3 products these clouns are selling…go figure. It’s amazing how this idiot stays in business. Over the past 4 years online I’ve heard a ton of horror stories about Sabastian Foss and his crappy products but I keep seeing his sales pages full of his 1-2-3 BS! Wow, Thanks for the info…I was given this software for FREE a few days ago and only used it once…I wasn’t sure it worked or not…I had no idea the comments that I sent were hit and miss, and that they were considered spam…..
hey Thor, I just found your site today, this was a good post. Too many times, people come up with the next tool/software that will “direct traffic to your site”. Unfortunately, it’s usually the same situation as this, it’s a fraud or a spam product. Thanks for this info, I will definitely be reading more of this blog. Thanks for the warning! I just got the spam in my email this morning. I thought “Hey that sounds great! but I’ll do a quick Google search first.” Lucky I did. And so it has. And thank you. I just received the same iNSTANT BOOSTER email, Googled, and found your blog. Thanks again, and good luck to you. Thanks!! I was reading this Sebastian Foss fellow website where he advertises his product at an introductory price of 50% off… that is only $49.97 (http://www.feed-blast@com/) and then I saw the same product sold at $19.95 (https://www.coralpalms@com/software/feed-blaster.html) (remove the @ sign for the URL to work). When I saw this, I wondered and did some more research until I saw your blog. So thanks for the information. I keep my b$20 and do something more constructive with it! thanks for this blog – found you by searching with Google to find out about instant-booster.com to see if it was legit – sounded too good to be true and it seems it is. So glad you did the hard work for the rest of us. Hope you get your money back too. Would love to know what tools there are for being able to get your site/blog etc out there legitimately and that works! If you know that and can really get the message out to us, you’d make a killing! I was trying to do some research on this product and came across your review. Im sure glad i did my research i almost bought that crap. I guess i was being lazy and wanted the easy way out. So im gonna blast one blog at a time myself . thanks this was very helpful.. This “internet marketing” company has been spamming my non-profit organization for weeks. Repeated calls and emails to the hosting company Hurricane Electric (http://www.he.net) have fallen on apparently deaf ears as I’ve not had any success in stemming the flow of spam. E-Trinity Internet Marketing appears to be responsible for the IP address and from what I’ve found so far it appears that they are either a subsidiary or a sub-contractor to Hurricane Electric and have been so for a number of years. Despite multiple attempts to contact Hurricane Electric and its president Mike Leber I’ve been completely unsuccessful with stopping this illegal practice. A complaint I filed with the Better Business Bureau will hopefully be more successful than I’ve been. In the meantime I would recommend that everybody steer clear of Hurricane Electric, E-Trinity Internet Marketing, Mike Leber and Blog Blaster, Feed Blaster, et al! Thank you so much for this write-up!! I love technology and I love software and I always want to believe these kinds of programs work. And sometimes they do. But I was worried this would be sending out comment spam and it looks like that’s just what it does. Again, thanks so much for taking the time to write about it – otherwise I would’ve had to buy it and find out myself – thanks for saving me the time! OMG… thanks for your information. I have to think twice to buy that services. Now I rather choose traditional method to promote my blog. At least, you have an excuse : when you’ve tried to look on google about this product, you didn’t find any scam warning about this Foss guy. I was scammed too, but no excuse for me, cause I didn’t even try to know about it on google before I blindly buy this crap. So shame on this scammer, and shame on me too to have though it could be possible to advertise this way. But it’s a good lesson : we get nothing without effort. If i had looked at this http://sebastianfoss.scammed.us before, I would have saved 50 bucks. Oppss… I’ve used the wrong e-mail… but Thanks again for your post. I do not know about the Blog blaster. I know the feed blaster works fairly well. It even posted my video to many feed sites. Here is the video it posted to syndicate 8 feed site. That is exactly what I experienced. Not worth the time, or trouble. If it sounds tooo Goood….It Always IS!!!! Well I for one was all set to whip out my Visa card because this programme looked as if it would be useful in promoting my online business opportunity.I might have ended up being closed down for spamming so thanks for the info regarding Blog Blaster,I will steer clear. But never could I say I learned everything about internet marketing from a single course. Thanks for the honest and true feedback. I always suspected Blog Blaster to be a scam, and I’m glad to have found your article to confirm my suspicions. It’s really sad that people like this exist who are simply out to create the next product to scam those that are trying to simply build an online presence or business name for themselves. I’ll be sure to tweet this link along as well so others know not to even think of purchasing it at all. Good read! Yes, it did change, when i searched for “blog blaster scam” this blogpost came up and i ended up reading this, nice honest review, this made me make up my mind to not buy anything that can end up as a spam tool. Thanks for writing such a wonderful post, you know it almost 3 years now but your words still offering its flavor as fresh as you wrote it back in December 2007. Although most of the people didn’t learn through your experience and have lost their hard earn money in purchasing that I usually called spam boosters.. You know even the spam persuader, its brand and its web site is gone but lot of people still advertising and promoting these boosters, you know why its only because it sound’s have capacity to misuse peoples desire to earn quick and easy money. Indeed a newbie can be easily hypnotized but how can we cleanup our network with such crap that has grown up like a pyramid today. Hahahahaha….I’m laughing all the way cos you just saved me from getting fried and scammed of my hard earned cash, got the email on my company email and wondered how it got through the security checks..lol…so I did a google search, found some other sites but your experience is real and it stands out. Thanks for helping and sharing. Let’s make the world a Scam/Spam free place. The feed blaster software and blog blaster look suspiciously very similar to the feed flooder product being offered by sam l carl at http://www.feedflooder.com. Thanks to this site for finding the scammers. Great coverage, these idiots spam a few of our inboxes every day and it’s getting tiring the amount of automated spammy garbage available on the web which lure thousands of website owners into thinking there are short cuts to internet marketing when simply, there isn’t. Would be great to see more a-list bloggers blog about the fools in the hope of making more people aware of their scams.